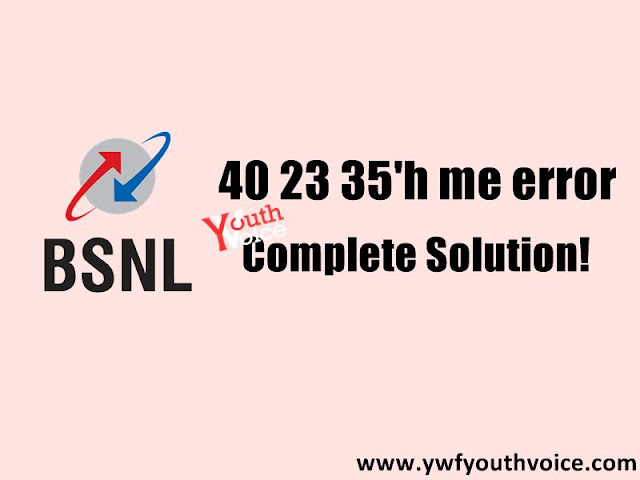 40 23 35'h me error - BSNL Sim Card Error Platform, cause, problem and complete real working solution to this error. I recently got this error "40 23 35'h me error" on my newly bought BSNL simcard, looked over Internet for some complete working solution, none of them worked for me, however I found out a simple solution which you can read below. Usually on BSNL Sim card,a similar network error may be seen on other sim card companies like Airtel, Vodafone, IDEA, Aircel, Tata Docomo etc. Not able to make a call or send SMS to anyone, not even to customer care in some cases. This error "40 23 35'h me error" shows up when trying to do so. Mainly this problem is noticed in newly bought BSNL sim cards before complete verification of user, you may have not accepted BSNL network settings for your phone and it might be having settings of old sim card supplier that's why you're not able to make any call or SMS. Second possible cause is that your BSNL mobile has not been recharged by the seller yet, after fist recharge error will vanish. Go to your mobile settings > then to network setting > then Mobile Networks > Network Operators. Choose network operator manually, after search select any BSNL network or whatever sim card you're having. That's it, try calling your customer care now. Still not working? Ask the seller to do your first recharge, it's the only reason for this error now. It will work for sure.